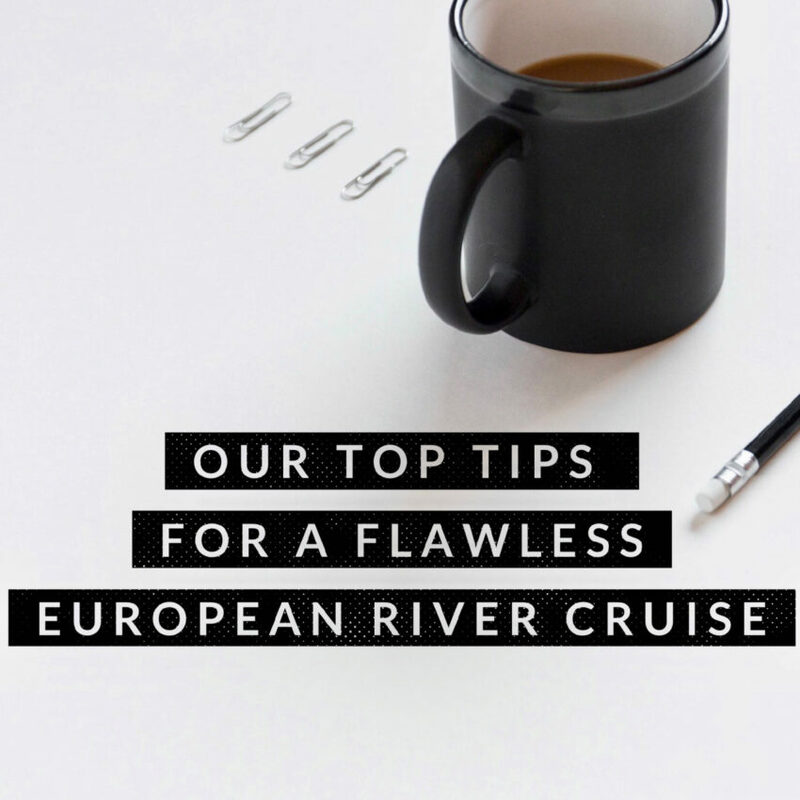 Unfortunately, a flawless river cruise is not as simple as booking space on any ship and stepping on board. There are many decisions to be made before packing your bags and leaving home, not the least of which are which river to cruise and which cruise company to cruise with. Preceding those two questions, however, you’ll also need to know if you are able to river cruise. That may sound like an odd consideration, but, in fact, some people aren’t able to river cruise because of physical limitations. Provided that you’re able to river cruise, you’ll need to figure out how much you can afford to spend. How will you get to the port of departure – and back? What do you pack? How much cash do you carry? How do you book your shore excursions? Which stateroom do you choose? How are gratuities handled? In this three-part river cruise tips series, we’ll answer all of these questions to help you obtain the best river cruise possible. We’ll cover it all, from how to deal with low and high water levels to how much cash to have in your pocket. 8 Starting steps to prepare for your flawless river cruise. 1. Know if you’re able to river cruise. The answer to whether you’re able to river cruise depends largely on mobility, and mobility on a river cruise takes two forms: 1) those who are disabled; and 2) those who have limited mobility. If you rely on a wheelchair, walker or scooter, you’ll want to give serious consideration about going on a river cruise. First, there’s the infrastructure in Europe to contend with. Sharp curbs and cobblestoned streets can make for rough going for the disabled and mobility-impaired. Second, river cruise vessels, in general, are not well-equipped for wheelchairs, scooters or walkers. As for those who have limited mobility, you could be fine, as long as you manage your expectations. While the ships can be comfortable for those who have bad knees or backs (or other issues that cause limited mobility), the excursions generally involve walking, and keeping up with your fellow passengers. With most river cruise companies, you’ll be able to find walking tours for gentle walkers, which are ideal for those who move, but move slowly. 2. Choose the right river. The Danube is our number one recommendation for people new to river cruising, primarily because it has so many of Europe’s marquee cities – Nuremberg, Passau, Linz, Vienna, Budapest, Bratislava (as well as a slew of charming villages). But if you’ve done the Danube, you’ll need to decide if you want to cruise the Douro, the Rhone, the Rhine, the Seine, the Moselle or any of the other rivers that course through Europe. Or maybe you want a canal cruise on a hotel barge. There are big differences between the rivers and the modes of transportation, but if you’re just starting off, forego the decision fatigue and choose a Danube river cruise. 3. Choose the right company. This one is full of complexities. There are more than a dozen river cruise companies, and each has its own style and price point. Let’s focus on style first. The luxury players, where everything is included – all alcohol (except select premium brands), transfers, gratuities and more – are Crystal, Scenic, Tauck and Uniworld. However, even with this tier, there are exceptions. Crystal and Uniworld, for example, do not include port charges. And the line between luxury river cruises and those that are not in that category is skewing. AmaWaterways’ new AmaMagna fits our definition of a luxury river cruise vessel. AmaMagna’s double width allows it to feature larger staterooms than on its existing fleet, multiple dining venues and many other attractive features. And while CroisiEurope doesn’t fit within our strict definition of luxury river cruises, the Strasbourg-based cruise company includes all beverages (except for select premium brands). With European river cruises, it’s a big mix of which river cruise best suits your style. For a glance at which company may be best for you, see our Comparisons for what’s included on your river cruise. Compared to other modes of travel in Europe – or even an ocean cruise, river cruises can be downright pricey. At the same time, river cruises in Europe can be quite a bargain when compared to other means of exploring the continent. That’s because, as alluded to above, so much is included. For starters, you’re getting a boutique hotel room, and a floating one at that. All meals are included, and on most ships, the dining is delectable. Wine and beer are included during lunch and dinner on nearly all river cruises. And most river cruises offer complimentary excursions, Wi-Fi, bicycles, airport transfers and more. Plus you get all that passing scenery. All that said, you need to figure out how much money you’re willing to part with. We break down river cruises into three categories on a cost per-person, per-day basis: 1) less than $200 per person, per day; 2) up to $400 per person, per day; and 3) more than $400 per person, per day. This is an important part of the process in choosing your river cruise. Be honest with yourself. Don’t just choose less than $200 per person, per day, thinking that you want the lowest price possible when you expect an all-included river cruise and a balcony stateroom. Create a realistic budget for your river cruise, and base your decisions on that budget. For help, see What’s A River Cruise Going To Cost Me? 5. Don’t go straight to your cruise port. While you’re creating your budget, be sure to add in the cost of getting to your cruise, and this raises another consideration. When do you want to arrive? We can tell you when not to arrive. Our recommendation is that you don’t arrive on the day of your cruise departure. Too many things can go wrong. We’ve seen flights canceled, resulting in delays in getting to Europe. We’ve seen luggage gone missing or delayed for days. Our recommendation is to arrive at least a day early, more if possible. In fact, we also recommend that you do not go straight to your port of departure. Use the expense and energy required to get to your river cruise to see something else along the way. Though it relates to ocean cruising, we’re headed to Venice in May for a cruise on Ponant, a French company operating a fleet of luxury cruise ships. We’re getting to Venice by way of Copenhagen, so that we can explore a part of Scandinavia where I lived for nearly a decade. And we’re getting to Europe six days ahead of our cruise departure from Venice. Routing through Copenhagen saved me thousands of dollars on business class airfare, and it also allows us to acclimate to the change in time zones, shaking off the jet lag that comes from crossing the Atlantic. Getting to Europe well ahead of our cruise also allows our luggage, should it be delayed, to catch up with us. I’m knocking on wood for good luck as I write this, hoping that all goes well, but at least I know I have done the best that I can do. 6. Book business class – or at least premium economy. Gone are the days when flying was an elegant (or even tolerable) experience — at least in economy class. If you can afford it or if you can find a creative way to make it happen, book yourself in Business Class when flying long distances. Business Class is where the vacation begins. You’ll experience faster check-in, faster security clearance (at some airports), lounge access, comfortable on-board seating, and most times, refined dining and service. Of course, you’ll need to weigh the benefits against the costs, but if it’s within reason, book Business to begin your vacation before arriving at the ship. Alternatively, book what the airlines are calling Economy Comfort, Economy Plus or Economy Extra, which can be had for a reasonable incremental cost (and often for free with certain loyalty programs). Last week, I wrote about how I booked business class tickets between Asheville, North Carolina and Copenhagen that were only a few hundred dollars more than the cost of economy class tickets. See Airfare Hacks: Cheap Business Class Tickets For Your River Cruise. I realize that not everyone is willing to pony up what it costs to fly business class, but the experience of a lifetime (your river cruise) should not be diminished by the misery that is economy class. From years of travel, I can tell you that I have stood in long lines getting through passport control and security while watching premium economy and business class travelers breeze right through. I’ve boarded the plane to walk by kingly seats with generous legroom only to squeeze into a small seat, crushed by those on each side of me, with my knees digging into the seat in front me, my self-inflicted torture for the next eight to ten hours. Don’t let it happen to you. The airlines can make travel downright miserable. It’s your job to make it better by booking a class of service that won’t leave you weary. 7. Make sure you passport is up to date. Most nationalities will want to make sure they have at least six-month’s validity in their passports before traveling to Europe. That’s what the U.S. Department of State advises U.S. citizens. If you’re traveling with kids under the age of 16, be sure to check their passports too. Children’s passports are valid for five years, not 10 years as is the case for U.S. citizens aged 16 and older, so you’ll want to look closely at the kids’ passports. Speaking of kids. Not all river cruise companies welcome them. Only a couple of river cruise companies allow children under the age of three, Crystal and CroisiEurope. Others allow children from ages 3 and up, while some require that kids be 12 or older. And one company bans kids altogether. See Can I Take My Kids on a River Cruise? Did you know that you’ll need a visa waiver to travel to Europe in 2021? Citizens from many countries outside of Europe (including the U.S., Canada, Australia and more) will need to apply for ETIAS (European Travel Information and Authorization System) visa waivers. We found this website helpful for learning more about ETIAS. Back in the 1980s, I traveled around the world with a hefty backpack weighing down my shoulders. As I traveled, my backpack became lighter and lighter and lighter. I started disposing of stuff because I got tired of carrying it, and I learned that I could do with a lot less than I had originally thought I would need. If there is one lesson that I have learned in my four decades of traveling, it is pack less. It’s a lesson I am still learning as I find myself at the end of a river cruise only to discover I didn’t touch half the items in my bag. As a rule of thumb, packing what you think you’ll need, letting it sit for a few days and then removing half the contents is not a bad approach. I’ve tried it before, and in fact, even then, after removing half the contents, I have found that I overpacked. For tips on how to pack, see What I Pack When I River Cruise, What About You?